Ok, it seems I am on an AI kick... First it was i-Que now it's Brian. Like i-Que, Brian the Brain contains the information from both the Encyclopedia Britannica and the Merriam Webster Dictionary and can give you information on any subject the you request. When you first power Brian up, he asks you for your name and a password. This way he can recognize you and won't give out your state secrets to the enemy. After he gets your name, he asks a few questions about you - birthdate, siblings, upcoming events... all sorts of data that he can use as you interact with him. After he learns about you, his owner, he asks about your friends. He can remember four of your friends in addition to you. Not only can he give you facts, he also tells jokes, plays a number of games, act as a personal assistant - reminding you of upcoming appointments, and guard your room against intruders. If you plug an MP3 player into the port on the back, you will be treated to a light show synchronized with your music. And on top of all of that, by plugging Brain into a telephone line, you can use him to make phone calls to all of your friends! I mean, seriously - this 'robot' does it all. 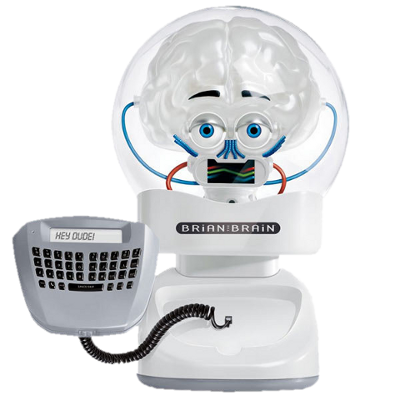 Unfortunately, Brian has be discontinued by it's manufacturer and the associated web site (www.MyBrianTheBrain.com) is no longer valid, however it seems that, for the time being at least, Britannica is still honoring the free three month trial offer using the Promotion Code: brainpromo. On a personal note - I am always saying that I could use a spare brain, that my current one is disorganized and cluttered. So, I am ecstatic about my latest thrift store find! I feel like Dr. Frankenstein - "Igor, where is my brain? Ahh, yes. There it is!"